While of course highly visible on the concert stage all over the world, Motif is something of a dark horse when it comes to recording. The Motif's sparkling array of live-playable sounds are, however, matched by a ton-and-a-half of inspirational recording tools that have not really had the spotlight they deserve. Co-hosted by erstwhile guru and fount of most if not all knowledge on the Motif platform, Phil BadMister Clendennin, this video takes you on a journey through all the twists and turns of using your Motif for "music production", i.e. recording. The video helps you to establish good working practices throughout the recording process, beginning with housekeeping and how best to load and save data to avoid frustrations, problems or, worst case, disasters. The nitty gritty of recording kicks off with the Pattern sequencer - what it is, what it isn't - and then shows you how to harness arpeggiated drums, looping, how to edit, create drum fills, use the effects, and much more. Rightly or wrongly, modern music production is as much about management as muse. On the Motif there's a myriad music management tools and processes available that let you turn a relatively humble idea, based on MIDI loops, into a full blown linear song you can store on Soundcloud or post on YouTube. Accordingly, the video shows you how to build up a composition using Pattern Sections, then chain Sections into a linear Song, and finally how to turn your MIDI into Audio without ever having to leave the Motif platform. However inspirational - and blisteringly fast - Motif is as a creative platform, most music production roads do invariably lead to a computer-based digital audio workstation. In addition to using the Motif by itself, this video also looks at three important DAW platforms and how they interface and can interact with Motif. LogicProHelp's David Nahmani provides an insightful look at the options with Logic (ProX), while Motif+Cubase is showcased by guru of the future, Darryl McEachin. Finally, the video calls on ex PreSonus senior product specialist Byron "steadyb" Gaither for the full rundown of dos, don'ts and how-tos when hooking up Studio One. 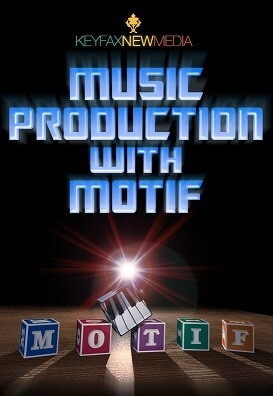 Music Production with Motif was filmed using a Motif XF but the content is 100% compatible with Motif XS. The video is 95% compatible with MOXF and 90% compatible with all of the Motif series. How come? Because the Motif sequencer engine is still very much aligned with the sequencer engine used ever since the Motif was born. All Motifs share the same basic concept of 16 Section, loop-recording style 'Patterns' and linear Songs. All Motifs share 16 track of recording. Etc etc. So, although this video was filmed through the lens of a 'current' Motif instrument, owners of all Motif models will find this video's words of wisdom a huge boost to their recording knowledge and music production capability. No matter how lengthy or brief your relationship has been with Motif, the chances are that you've hardly scratched the surface of its recording features. This video opens doors you either didn't know existed or maybe were just reluctant to look behind! * Cubase, Logic, and Studio One are registered trademarks of Steinberg, Apple, and Presonus respectively.